Timber is a term used to describe wood, either standing or that has been processed for use? from the time trees are felled, to its end product as a material suitable for industrial use? as structural material for construction or wood pulp for paper production. Founded in the year1996 at KOLKATA, we, SYLVAN, are a firm engaged in Trading and supplying a wide range of Wood Timbers and Plywood Material. Additionally as per the requirement of our clients, we further undertake quality testing for our products, which include chemical treatment and seasoning. Our quality controllers test the entire range on the basis of various parameters, which includes holding capacity, finish, durability, sturdiness and designing. 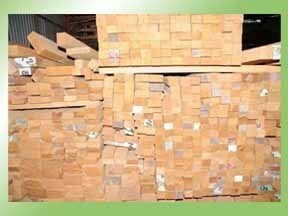 Moreover, we own a capacious warehouse to ensure safe storage of our wooden products till the dispatching of the orders. Owing to our client-centric approach and in house transport facilities, we have been able to build a large client base.